Congratulations for being selected to play for the Trosky and Kali Baseball’s 2019 Summer Team! Going into the 2019 Summer season, we are looking for coachable high school players that have the talent and desire to play at the next level. Through our unique and detailed program, we prepare and provide opportunities for aspiring baseball players to take ownership of their future, making college baseball a reality! Please register ASAP. Below you’ll find the link to register, team information, team schedule, uniform and payments options. Take advantage of this great opportunity by registering today. Spots are limited therefore don’t delay. Please confirm that this acceptance email has been received. Since 2011, Trosky Select Travel Teams have accomplished the following (the numbers below do not include players attending Trosky baseball showcases/camps). *AC players are selected by the MLB scouts and recognized as the countries top future draft selections. We are currently solidifying our team rosters, and we currently have you a spot reserved. At this point we're asking for final your decision. At this point please solidify your roster spot by clicking on the link below and registering. Please let us know if you have any questions. MLB Player Evaluation Day- Receive a evaluation from a professional scout. 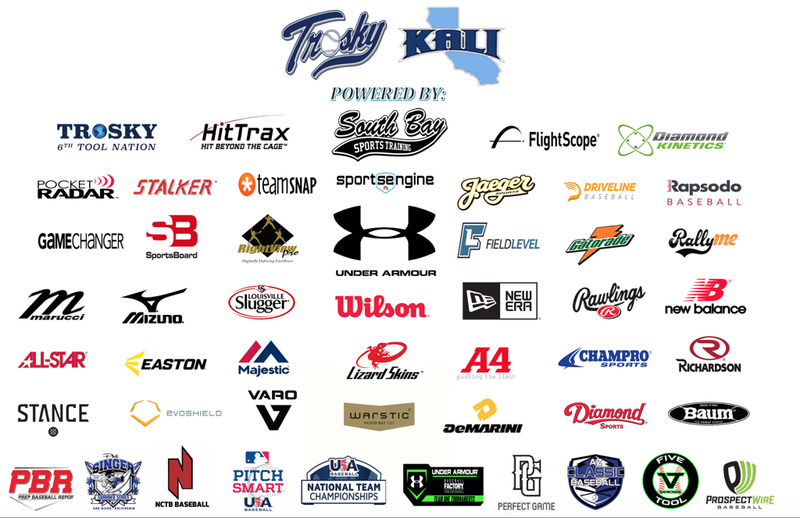 High School & College Preparation (Since 2011, Trosky & Kali Baseball Travel teams have had 500+ College Commits, 116 MLB Draft Selections, and 95 Area Code Selections. Field Level ranked Trosky Baseball #2 in the country in a list of most college connected organizations in the country. College Preparation Program– Our College Preparation Program is focused on taking high school player’s skills and mindset to the collegiate level. We are a huge resource to players by guiding and promoting them through the college recruitment process. We pride ourselves on having our players prepared for the collegiate level. We help our players reach their goals by assisting their placement in a college program that best fits them. Payments are made via Credit Card through several payment options. ***If there are ANY financial issues, please contact us ASAP for sponsorship and scholarship opportunities. We do not want money to be the barrier for players to take advantage of this opportunity. **There are no refunds on team fees for any reason (including but not limited to injuries and illness). Once you have committed to the team you have taken a roster spot that could have been offered to another player. A Note from Coach Trosky: Nearly 30 years ago I started running skills development baseball camps for high school and youth players. I truly love the developmental side of the game, and early on in my life it became my passion. After about 15 years of running training camps, numbers began to drop because kids would rather play travel ball and be seen by college coaches then go to camp to learn about baseball fundamentals. At this transition time in the baseball culture, I adapted and moved the focus of my business from player development to travel ball, showcases and college exposure. Within the change over the past 15 years I’ve enjoyed my occupation and I’m sincerely grateful for the many relationships I’ve built and for the extensive education that has taken place in my life from being surrounded by some of the best in the game. Within those years of growth and collaboration, I developed creative ways to bring player development (both mental and physical) into the showcase and travel ball world. Entering into the 2018 travel ball season, I am excited to offer a new Complete Player Development (CPD) model to all the Trosky Baseball teams. Intent / Accountability / Culture: Intent, accountability and culture are the three pillars for our players reaching their fullest potential. A few years ago, New Balance / Area Code Baseball hired me to run their National Camps, and recently I was hired by MLB to be the Director of Player Development (BTS / USA Baseball). The same model that I created for Area Code Baseball and MLB (BTS / USA Baseball) we’re implementing with our Trosky teams.This player development model that we’re offering our players is completely unique. It is a model that has not been established and accomplished before in travel baseball.